A map of Normandy France will show you exactly where Normandy is located and how large it actually is. First, you will see that Normandy is located in northern France along the coast of the English Channel and is comprised of Upper Normandy and Lower Normandy. 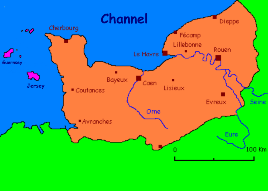 Further, you will see that Normandy is divided into five departments (a department is comparable to a county in the U.S.): Seine-Maritime, Eure, Orne, Manche, and Calvados. Normandy is most strongly associated with D-Day, when the allied troupes stormed the beaches of Normandy, which began the events that ultimately secured the downfall of Nazi Germany. 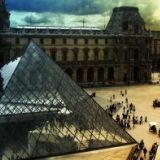 Furthermore, Normandy has a rich history dating back to the early invasions and settlements of the Romans and Vikings. If you follow your map of Normandy France, you can actually go from town to town and from village to village and retrace the steps of the brave men of the allied forces during World War II. However Normandy is not all about the past. Present-day Normandy is lush and green, boasting many forests, a wonderful coastline, beaches, golf courses, and many pleasurable activities. In fact, Normandy is gaining in popularity as the perfect destination for a cycling holiday. If you grab a map of Normandy France, you can use it to help plan your route. A recommended map for this purpose is a Cartes de Promenade map from the Institut Geographique National, which shows all the Grande Randonnée routes (the registered hiking trials). However if you prefer, there are plenty tour-operated cycling groups to join which provide bikes and helmets so that you simply enjoy the experience without worrying about routes and equipment. What else is Normandy best known for? Camembert cheese, Calvados brandy, fresh lobster and oyster caught right off the coast, the Place du Vieux-Marche where Joan of Arc was burned at the stake, Impressionist art museums, the city of Giverny, where you can view Claude Monet's house and explore the beautiful gardens that inspired his most famous works – and much more. Holiday apartment rental in Normandy is also on the rise. 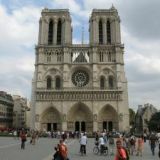 To look for an apartment to stay in while you are vacationing in Normandy, search the Internet, where many travel sites will tell you exactly what apartments are available for rent, how much they cost, what attractions are located nearby, and related information. If you are traveling on a budget, simply enter an acceptable price range and see what's available. After you have chosen all of your criteria and a matching list appears, pull out your map of Normandy France to see exactly where it is located. In many instances a picture of the property will also be displayed, along with an in-depth description of all the amenities you will enjoy when you get there!